Imperial Beach Community Pays Tribute to the Fallen at their Annual Memorial Day Service at Veterans Park on May 29th, 2017! On Memorial Day We Pay Tribute to the Fallen, Those that Paid the Ultimate Price, so we could have our Freedom! Like the men that had fallen in service for their country, nothing like a little overcast and morning fog was going to stop the Community of Imperial Beach from coming out and paying tribute to their fallen soldiers that defended our country's freedoms at this Memorial Day Service in Veterans Park in Imperial Beach this overcast and misty Monday morning. 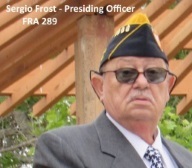 Presiding Officer, Sergio Frost, of the Fleet Reserve Association Branch 289 (FRA #289) opened the Service Monday morning. With the Color Guard bringing in the flags the "Pledge of Allegiance” was said, the Chaplin said some words and then short speeches were made including that of Imperial Beach Mayor Serge Dedina. The guest speaker, Imperial Beach City Councilman Mark West, a 22-year veteran of the Navy, gave an inspiring speech reminding the audience that our loved one that died defending our country did so that we could have our freedoms, to celebrate them for what they did for us and for us to live our lives to the fullest. Later, tribute was paid by individuals to their fallen as their names were read, the bell was rung and their loved ones came up and said some words for them and then flowers were placed on a table in front of the audience. 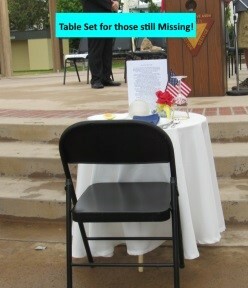 represent those that haven't come home yet, those still missing and the hope that one day they return. Honor Guard was there from the 82nd Airborne and shot off a 3 Gun Salute for the fallen. After that the service wrapped up. Half of the Flowers were given to a Women's Home and the other half were taken and dropped off the end of the Imperial Beach Pier. The Fra #289 then invited them to come over to the lodge where they were serving Sloppy Joes and had some delicious treats such as cookies and cake.